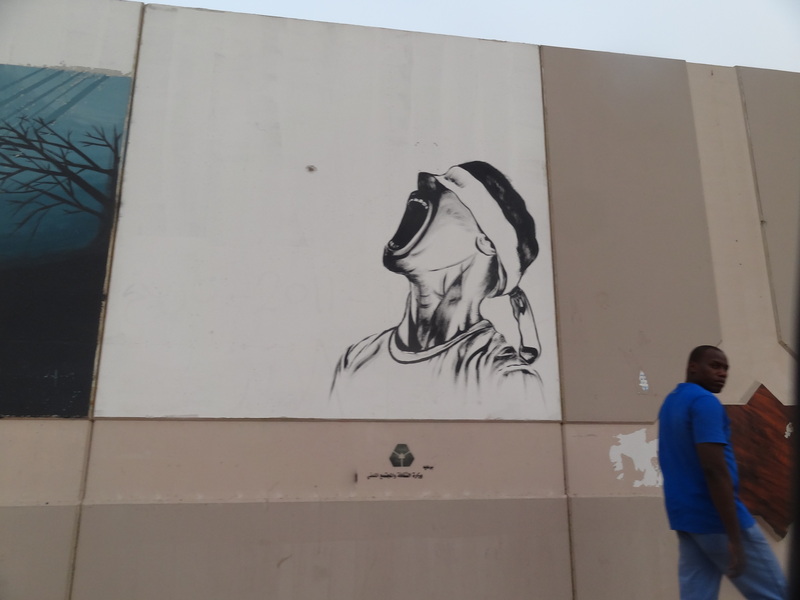 Graffiti art in Tripoli, Libya. 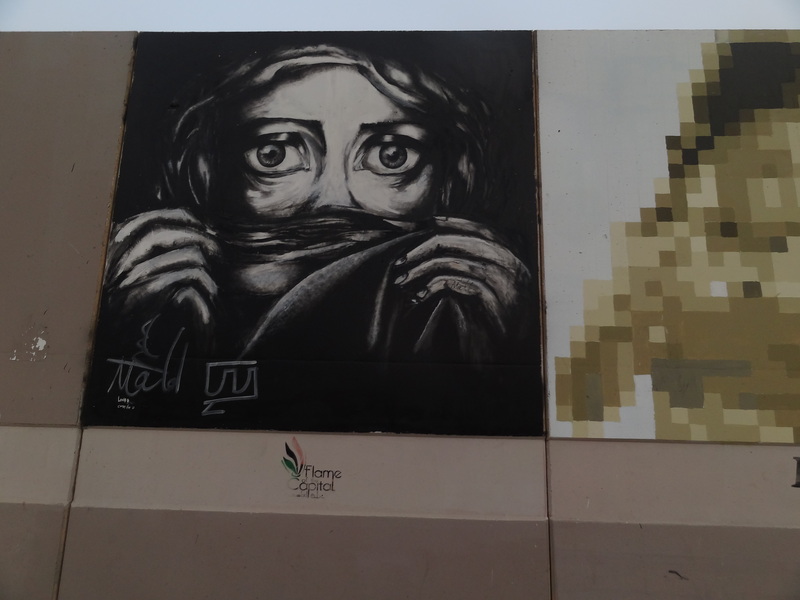 The city sponsored artists to create art on each panel of a retaining wall along a road coming into Tripoli. Having lived and worked in multiple war-affected countries, I have grown used to the inevitable ups and downs of transitions from war to more peaceful countries. I use the term “more” because the reality is that just because active conflict may end, transitions are fraught with continued instability, often for years if not decades to come. Libya is no different. After the fall of the Gadaffi regime in 2011, Libya, like many transitional countries, has struggled to establish a just and secure state. Militia members, who may or may not have fought in the revolution, are loath to relinquish the power they have secured and the weapons that they feel keep them safe from a variety of threats, including other armed groups competing for power, those seeking to settle scores, even common criminals. The central government itself is struggling to establish functional institutions based on principles of accountability, transparency, inclusion and justice where none existed before the revolution. No easy feat — even in stable environments. 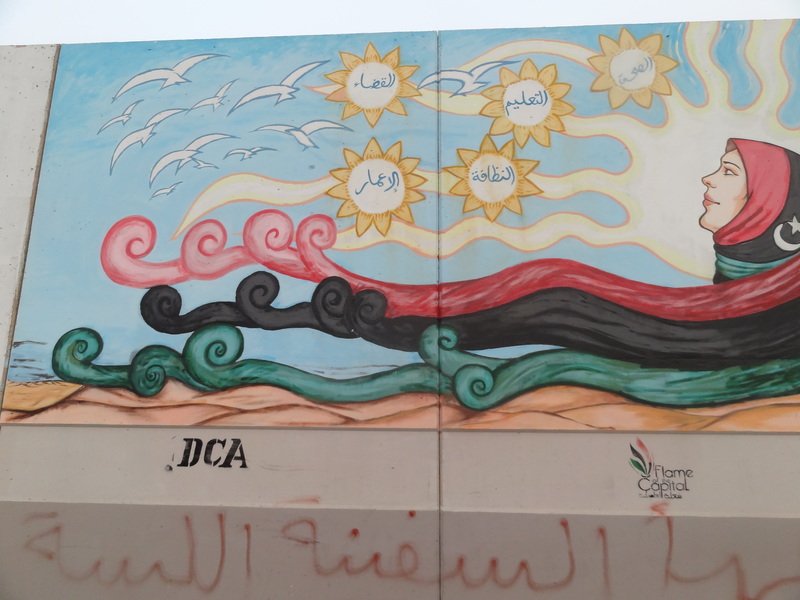 But doing so in Libya, with trauma from the conflict still so fresh in the minds of Libyans, pre-existing and factitious divisions that span decades, sometimes centuries, combined with the legacy of the Gaddafi-era scare tactics — is a much higher hurdle to overcome. 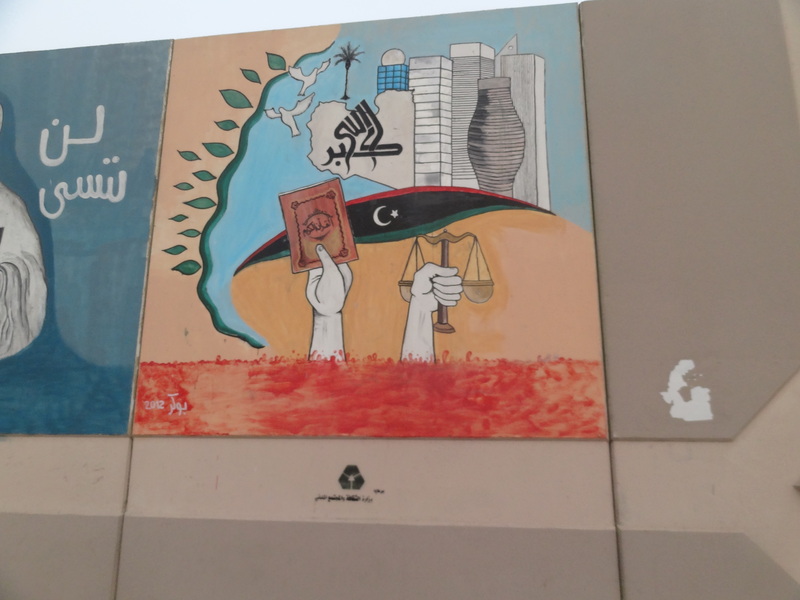 As wheels touched down in Tripoli, so began my third trip to the Libyan capitol since the revolution ended. 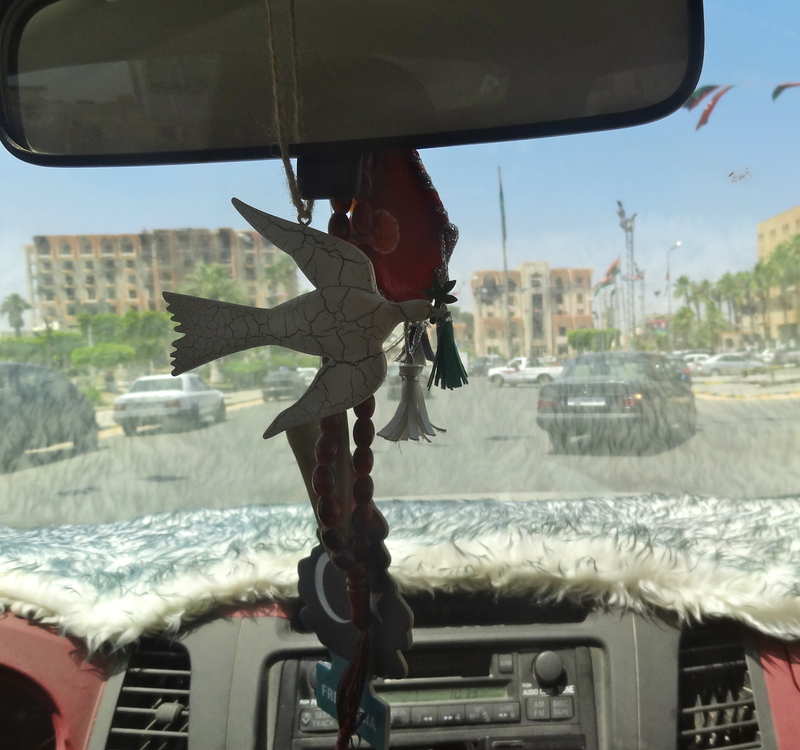 My first visit came shortly after the fighting to oust Libyan dictator Gadaffi had ended, and the new transitional government sought to avoid, or at least gird for, the many pitfalls that often follow such violence. Between my own visits, my colleagues have been in and out of Libya multiple times, providing as close to an uninterrupted presence and continuity as possible in the face of limited budgets and resources. As we drove from the airport, I noticed some minimal upgrades in security that had been made since my last visit. Upon arriving at our hotel – off the beaten path and far from the center of the city – I was surprised to discover what could only be described as an oasis. Here, lush green grass, palm trees, and a hospitable staff made a convincing argument Tripoli was slowly regaining its feet, compared to my earlier visits. There was not the usual din of noise around us, but an unexpected quiet, complemented with a tranquil serene surrounding. Under different circumstances, I am confident this was a place I could come to relax. As we met up with colleagues and poured over our schedule and agenda for the coming eleven days, we set off for the hotel’s dinner – an outside barbeque on this particular evening. As we began our meal, the silence and serenity was interrupted by gunfire just beyond the compound walls. Gunfire is not an uncommon phenomenon on these trips. In fact, during my first trip to Tripoli, a full-fledged rocket propelled grenade battle erupted down the street from my hotel. But you can always measure what your own level of alertness needs to be by judging how those who experience such events daily react, and since no one else at our dinner seemed overly concerned, we went on eating. But then there was a loud, unsettling “boom.” At this point, a number of people stopped what they were doing and turned toward the blast – including the wait staff. After one more blast, we were all alert and silent. Then the familiar crackling sounds of fireworks followed, and we all let out a visible sigh of relief. It never fails to amuse me that countries the world over, having so recently experienced the brutality of war, still prefer fireworks and gunfire to celebrate everything from weddings to weekends, or just letting off steam. The second day, we moved from the calm oasis on the outskirts of the city into a hotel that could accommodate our full group. 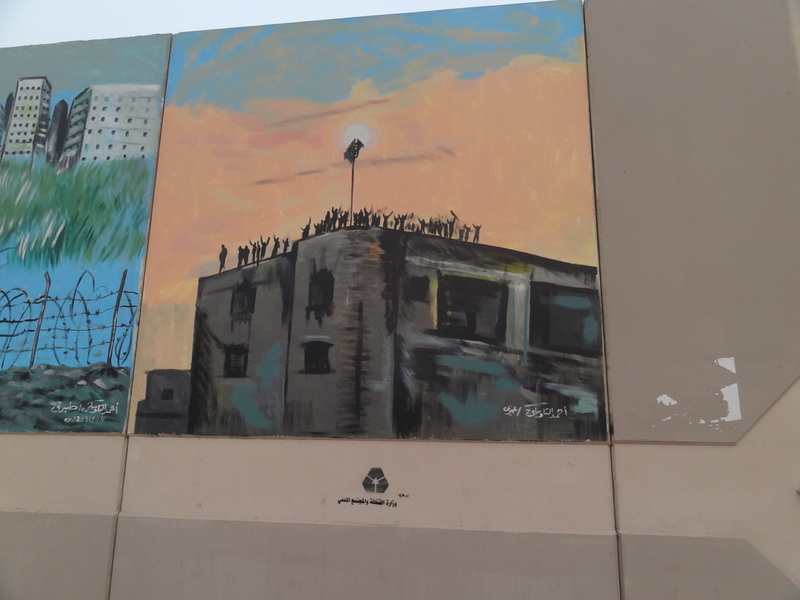 It was in the heart of Tripoli, and driving in I saw the sites I remember from my previous trips – the Mediterranean Sea, Tripoli Towers, the Old City and its Ottoman Empire Walls, pock marked with the destruction of current generation ordinance. As we drove into the city, the one major change was the Tuesday Market roundabout. There were four very orderly and well coordinated checkpoints set up – staffed by different security personnel (some in standard police uniforms, others in green fatigues, some in black uniforms, with vehicles parked to their side including everything from standard police cars to small pick up trucks (“technicals”) mounted with Russian-made DShKM 12.7 heavy machine guns.) As we drove through one, there were about 4 “lanes” in which officers were inspecting cars as they drove by. At first, it seemed like they must be looking for illegal armed groups or others that might cause harm, but as we drove through our lane, cars were being pulled over for a myriad of violations – improper or no license plates, illegally tinted windows, etc. And not only were these cars being pulled over, the police were issuing tickets. After two years, this is a clear indication that, in the capital city at least, police were carrying out policing functions beyond filing paperwork. These small signs indicate that the security apparatus is beginning to chip away at the lack of state control – even if just a small chip. Day 3 – Into a lion’s den? On the third day of the trip, we were driving to another town to host the pilot Justice and Security Dialogue (JSD). The event would last two days, and was the culmination of my colleague Christina Murtaugh’s month long planning. On the way, I was pleasantly surprised to see a traffic cop in a immaculate white uniform, with cap on head, directing traffic in a most professional way, with all the drivers obediently honoring his instructions. Then came the first hiccup. We got an urgent call from our Libyan colleague who suggested we contact him upon reaching the outskirts of the town. He informed us that the main highways had been shut down. He didn’t give a lot of details, but as we neared the town, we saw his car waiting for us. We followed him as he wove his way into the town center through back roads and side streets. We learned that the main highway had been blocked by a local militia that had been battling a rival over the past month, resulting in numerous casualties on both sides, as well as a number of prisoners being taken. The militia in question was blocking the highway to protest reports that the neighboring militia had reneged on a tentative peace agreement forged by the two adversaries that stipulated each would release their respective prisoners, while only their own side had followed through on the agreement. Eventually, we arrived at the location where we were to conduct our meeting only to find trucks and cars lined up on either side of the road for more than a mile and the entrance to the location blocked. Despite the backlog of vehicles and barred gate, everything appeared calm on the surface as Libyan Shield (former militia members that are now part of the Ministry of Defense) were milling about the entrance. Libya Shield had also been serving as de facto peacekeepers between the two squabbling militias I mentioned earlier. So we cautiously made our way to a back entrance and entered the location. We learned that this protest was the result of yet another local militia wanting local companies to employ them. With our own adrenaline piqued after such an arduous commute, we openly questioned whether it would be possible to get such desperate and divided groups to join us at the table to initiate discussions around these and much more pressing justice and security challenges. Our own unease aside, the palpable tension seemed to provide the ideal backdrop for substantial progress. 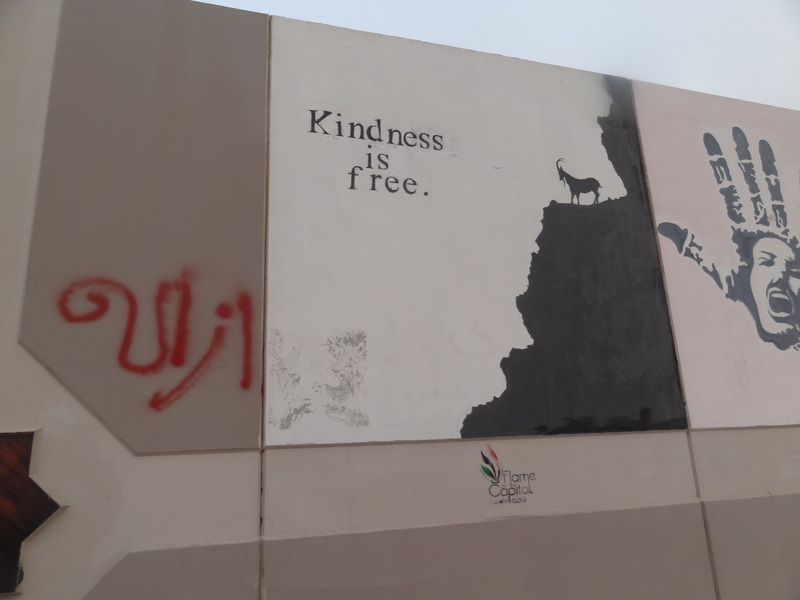 In fact, rather than the traditional platitudes and niceties – a part of the cultural fabric of Libya in which they take great pride in being gracious hosts and making each visitor feel at ease and welcome – each participant talked openly and honestly about the severity of their challenges, the extent of their differences and each’s understanding of the root causes. This transparency and honesty is an essential and necessary ingredient toward establishing real and constructive dialogue and finding solutions that will actually improve the situation, but usually takes time to foster. The fact all the tension was already on the table at the outset gave us hope as we left the first day. On the second day of our dialogue, all the of the overt symptoms of the immediate security challenges were gone – negotiations the previous evening ended the road blocks, and the militia, blockading the location where we were holding our meeting, had sufficiently made their point known with their protest the previous morning and were nowhere to be seen. We came into the dialogue with renewed spirit – day two was about finding solutions to the difficult challenges aired in day one. The participants made significant headway, and by the end of the day there were a number of constructive solutions. The participants had agreed on a short-term roadmap, selecting one idea to begin working on as a test of their collaboration. 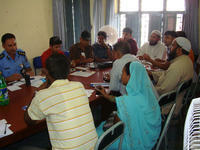 And they had selected a steering group in which to drive their work. But most of all, we had grown close to this group, seeing the real struggles they are dealing with in bringing justice and security to this small corner of Libya. By the culmination of the two-day dialogue, we were confident that seeds to real partnership had been planted, and the mechanisms in place to ensure they developed fruit. 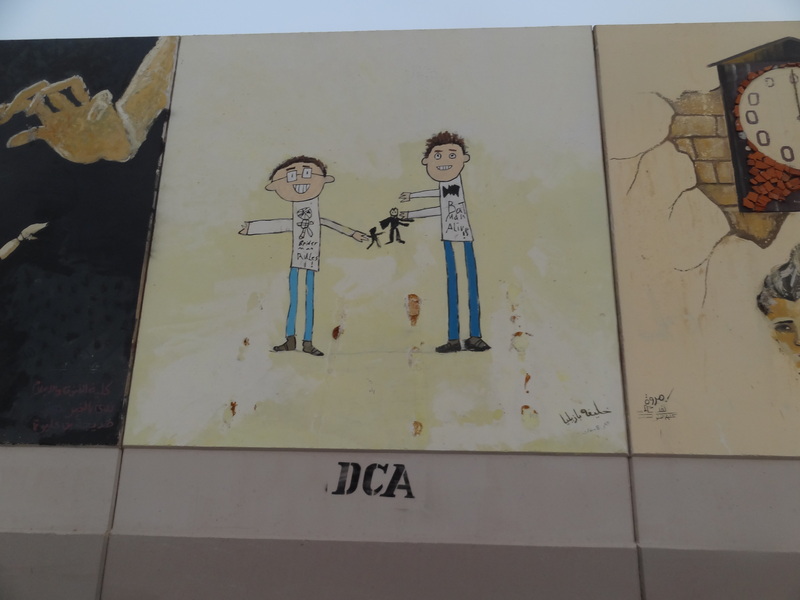 After the JSD sessions, we returned to Tripoli. 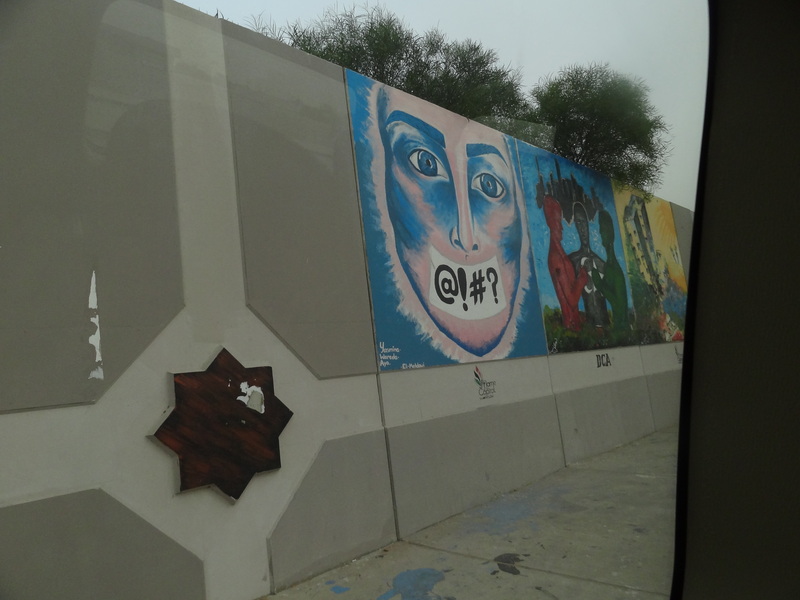 As we drove back to the capitol city, we had opportunity to reflect on the experiences the two days prior. While encountering roads blocked by various militias on separate occasions, it would be easy to feel disheartened. But the fact that, in both cases, the militias had chosen peaceful protest and civil disobedience over brute force was actually an encouraging sign that perhaps slowly but surely even the militias are evolving toward rule of law over rule of the gun. That afternoon our sense of encouragement was further bolstered as we conducted a workshop with a group of youth on facilitation skills. This group of five – from every corner of Libya – energized my colleagues and myself with their enthusiasm, dedication and inventiveness. These youth put in hard work over the first two days of our training, epitomizing the raw leadership, ingenuity, and work ethic that permeates the Libyan society through and through. 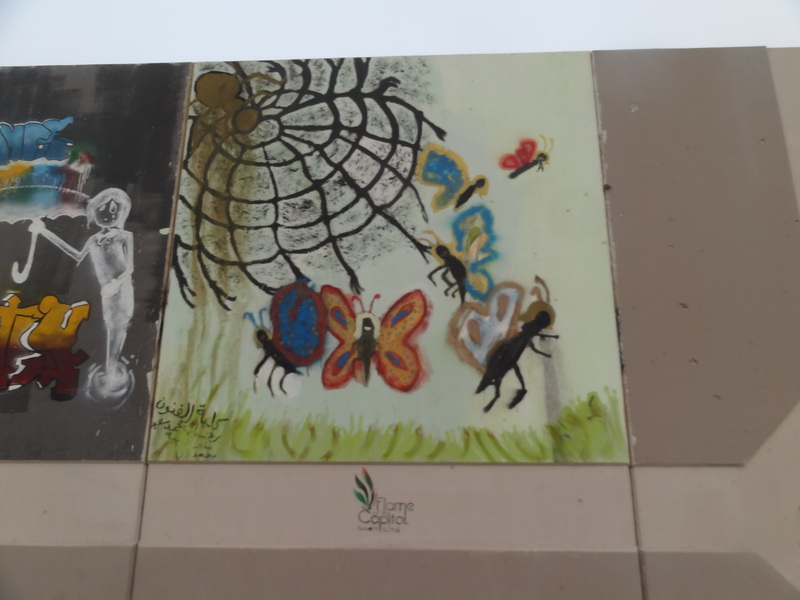 Of course, all these positives come with the unanswered question – how to harness the youth’s exuberance, idealism and raw abilities to promote lasting peace and prosperity throughout all of Libya? 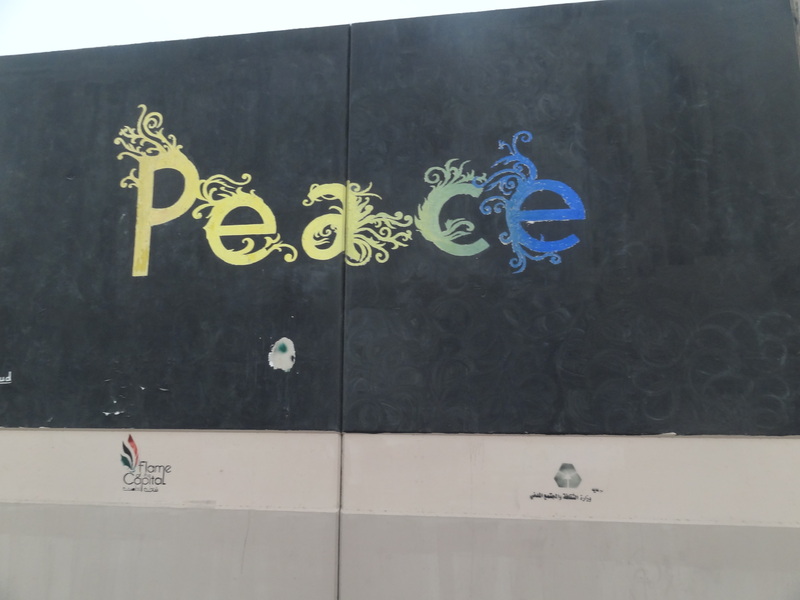 On our sixth day in Libya (the second of youth facilitation in Tripoli), word came down in the early evening that the Russian Embassy, just blocks away from our training, had come under sustained attack by a group of armed men, who had breached the embassy grounds. As seemed to be a theme throughout our dialogues, the reasoning for the attack was far ranging and often contradictory. The one consistency in the story was that a Russian woman, unattached to the embassy, had killed a prominent Libyan revolutionary. Some said she was the man’s wife, while others insisted she was a pro Gadaffi loyalist. No one in the embassy was hurt while two of the attackers reportedly were killed. Three a.m. the next morning, I was startled awake by gunfire followed by explosions. Unlike the “celebratory” fire I heard on my first night in Libya, this was clearly different, clearly a firefight. It ended after about five to ten minutes and the night calm returned. Sleep, on the other hand, was not quite as resilient. Later that morning I would learn that there had been an exchange of gunfire on the street of one of our youth participants. She said she had been awoken when the windows of her home began to rattle with each fusillade. She said she was instantly taken back to 2011 and the war in Benghazi. Later we learned, although, like many things in Libya, one can never know for sure, that it was a battle between two rival groups, either drunk or on drugs. 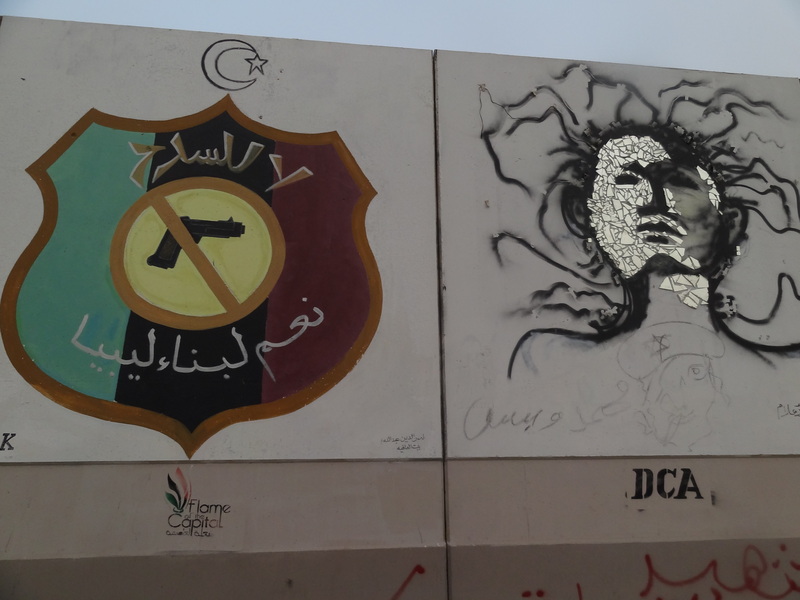 Sadly, like many societies coming out of conflict, the drug and alcohol trade and organized crime in Libya have been very quick to exploit any security shortcoming the moment it materialized. Day 8 of the trip coincided with the start to the weekend in Libya. With the groups and motivations behind the assault on the Russian embassy still unknown, we felt it best to keep a low profile as the situation became clearer. As reports on the Russian embassy attack trickled in, news of a series of assassinations earlier in the week of former and current security personnel in the eastern part of Libya, around Benghazi, added to our general unease. A few days earlier, a naval officer and his eight-year-old son were killed as the man took his son to school. Earlier in the week three army officers had been killed. (Other assassinations were to follow, including the killing of a senior retired police officer two days later, on Saturday. Then on Sunday, a Colonel in the Libyan Air Force was murdered.) Our colleagues have told us – this is what they have now come to expect. Very targeted attacks on individuals that have a symbolic message as well. After all of this bad news, we were hoping our ninth day would bring a bit of peace. Security is never far from any of our minds. While the nature of the job of a peacemaker is to venture into places where there is no peace, we do not do so without ample caution, prudence and no small amount of apprehension. On our ninth day, we travelled back to our colleagues from the JSD roundtable to establish next steps following our dialogue. We weren’t sure what to expect, or what they wanted from us in terms of partnership. Upon arriving in their city, we first met with the police who had participated in our preliminary dialogue. Through our conversation, they reminded us that we had mentioned two things essential to the success of our partnership with his city: (1) we must ask what people think, and not impose ideas from the outside; and (2) we must start with what can be achieved, working on the small activities, and not try to solve all Libya’s problems at once, or we’d be overwhelmed by the complexity of the challenges. We then met with the steering committee that had been appointed during our previous discussion. The group had made amazing progress in the six days since our initial dialogue – they had a plan of action, a division of tasks, and had created timetables, and points of contact. Yet we discussed the planning and process, it became evident that each group had carved out different objectives based on their goals, and not necessarily respecting the others sitting across the table from them. In many ways, it was a microcosm of the community at large, and the motivations and power struggles that exist everywhere, including my own country. It became clear that each participant needed to spend more time on their own internal process, laying ground rules to ensure respect for one another’s interests as well as their own. It was a teaching moment for both them and us. Without an inclusive, transparent process, occasionally, the only progress that can be made is backwards. Or at least, back to the drawing board. Despite the setback, we left encouraged – seeing just how much work and effort the group put in, and the willingness to do more and to compromise – each with the common goal of moving forward. We also witnessed just how difficult making change can be, and how important it is to give each process – no matter how small or large – the time needed to achieve sustainable impacts. As we made our way back Tripoli, our own progress came to a screeching halt. As we walked in the old city, comparing notes about what we had accomplished and what we had left to do, I checked my Twitter feed only to learn that an accused member of Al Qaeda had been nabbed off the streets of Libya. Speculation was ripe as to who could have carried out such a mission, but with a five million dollar bounty on his head, and accused of plotting the 1998 U.S. embassy bombings in Kenya and Tanzania, it was widely believed to have been a U.S. forces-led operation that had taken Abu Anas Al-Libi. As the Twitter began filling with such suspicions and concerns about retribution, we returned to our hotel to get more information. Official statements from the U.S. government confirmed that U.S. forces had captured Al-Libi. A colleague from Benghazi reported that a Facebook page had been set up with a phrase along the lines of, “We are all Al-Libi.” Meanwhile, many other Libyans I met expressed relief at the operation, and that Al-Libi’s abduction was a good thing because he represented the extremism plaguing so much of the country, responsible for many of the targeted killings and continued instability. I heard from other Libyans who expressed concern that the U.S. acted unilaterally and didn’t allow Libya’s own justice system to operate in the way that it should, thereby violating Libya’s sovereignty. Still others wondered how Al-Libi could walk the streets of Tripoli with a large bounty on his head for so long without action from the young Libyan government. Further, they questioned why the U.S. was able to tackle Libya’s militants while the Libyan government seemed unable or unwilling to address the extremist problem with the same resolve? While others expressed they wished their own government had handled the developing crisis with more tact, that rather than proclaiming that they had no prior knowledge of the raid, that it would have been preferable if the government had made a strong statement condemning terrorism, while couching their sovereignty concerns in that context. Many speculated on whether there would a violent reaction to the raid and who would be targeted. Given this, and working with our many colleagues on a risk assessment, we decided it was best to lay low in our hotel until we flew out the next day. • The excitement and exhilaration that comes with the realization that with Gaddafi gone, entirely new options, promise and opportunity await the new Libya. • The despair and disappointment that inevitably comes as groups try to exploit even the slightest gaps and security vacuums that materialize as the new system of government takes to its feet. • Dismay at the power-hold militias have created for themselves by force, unwilling to cede an inch of the ground they gained in their push to topple Gadaffi. • The hope instilled in the young generation and the potential and opportunity they possess that their forbearers did not. While these 11 days riding the roller coaster that Libya has become, my own government was going through its own gyrations with the government shuttered and negotiations to revive its democratic processes at a standstill. And in five days since I left Libya for another African country where I am working now, the roller coaster ride in Libya hasn’t changed. Its Prime Minister was detained by a government-backed militia group, only to be released hours later. Prime Minister Zeidan has since called this an attempted coup. Extremists in the eastern part of the country have grown frustrated with the governments’ role in the Al-Libi case and have threatened retaliation. Over the past week, a number of security incidents have occurred: the Swedish consulate in Benghazi was struck by a car bomb, while the wave of assassinations have continued unabated. Yet, the fact that the militias chose to show their displeasure with the Al-Libi capture with a peaceful protest rather than violence can only be seen as an encouraging development. I continue to turn on the news, glance at my Twitter screen every few minutes, and look on Facebook to see the next turn that Libya takes. But most importantly, communities the world over must strive to recognize their common interests, because ultimately, whether a household, a city block, a city, state, country or continent: united we stand, divided we fall. The U.S. Institute of Peace (USIP) will draw on its innovative effort to sponsor dialogue between security agencies and civil society in Nepal and Iraq to develop a new “toolkit” to help practitioners in the field run similar programs in Iraq and other transitional or post-conflict countries. The new effort is funded by the U.S. Department of State’s Bureau of International Narcotics and Law Enforcement Affairs, the Bureau of Democracy, Human Rights, and Labor and USIP itself. It will bring together specialists for working meetings this fall to identify the contours of a practical, how-to toolkit, including training and other videos and a justice and security manual laying out methods for conducting such dialogues. Those elements of the toolkit are to be completed and translated into Arabic by next summer, when they could be used for further programming in Iraq and elsewhere. USIP’s dialogue efforts in Nepal, which began in 2006 and continues today, are meant to help bridge a gulf of mistrust between civilian police and the justice and security sectors, on one hand, and civil society and local communities, on the other. That mistrust, aggravated by many years of political and other conflict in the Himalayan nation, has hampered Nepal’s ability to provide security and justice, and deepened tensions in ways that have hindered economic development and good governance. A similar dynamic has played out in Iraq and other countries that have suffered from conflicts and experienced jarring political transformations. Just one example of the impact of justice and security dialogues in Nepal is when USIP established a forum for dialogues to build trust between police and civil society and to address challenges to security and the rule of law in Biratnagar, Nepal. Following two dialogues that examined why youth seemed to be increasingly participating in lawless and violent activities and what young people could do to reverse the trend, participants agreed to a nine-point Birat Youth Declaration and promised to work with the Nepal Police and civil society to strengthen security and the rule of law. After a year, the impact was dramatic. According to the Nepal Police, in the district of Morang violent demonstrations carried out by youths fell more than 80 percent because of USIP’s involvement. The future toolkit will also draw on the experience of USIP’s rule of law work to date in Iraq, Yemen, Sudan and South Sudan. USIP specialists say it will help identify and sustain the best elements of justice and security dialogues for use in other settings in the future. Yet, they also caution that justice and security dialogues must be tailored to the specific context of a country and its dynamics: No one size fits all. Justice and security dialogues are a critical tool to help build a positive and collaborative relationship between the community and the various justice and security stakeholders in transitional or post-conflict countries, says Colette Rausch, director of the Institute’s Rule of Law Center. “The complex challenges of our world can only be resolved when people come together to understand and overcome differences, build trust and work together to solve problems,” she says.